This very handy, versatile, top quality, highly collectible, classy, flat bladed pocket knife can be used in a variety of ways. A collectible knife such as this one, would be a great gift for Dad, Mom, Boy Scout, Girl Scout, Sr. Cub Scout, or an Eagle Scout. Take it camping, hiking, fishing, cruising, or boating. Many people keep one of these highly functional and collectible pocket knives in their car, and one in the house for emergency use, or general everyday use. How many times have you gone into a super home center, and had to tie up a piece of wood to your vehicle, and had no pocket knife, cutter, or sharp blade to cut the twine off? Or maybe you just needed a nice pocket knife to open up a package? This pocket knife is not a switchblade, so it is legal to carry with you (check your areas laws first). 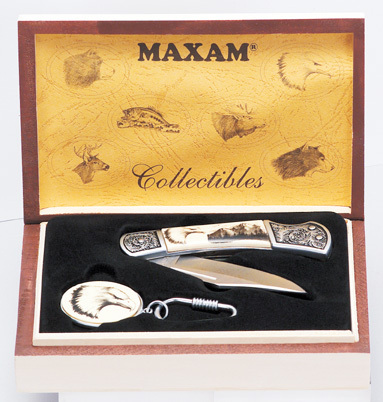 This is highly collectible pocket knife and key chain set is a great gift idea. The knife is also an excellent knife tool to whittle wood with, and make creative designs with. Its even great for carving, paring, gouging, or lancing. No need to spend big money on those other over priced collectable pocket knives any longer. Because here at AAWSALES.com, every item is priced at dicount sales prices! Buy now, before these combination collectible lockback pocket knife and matching key chain sets are all gone. Remember to checkout our super low wholesale prices and our quantity price breaks on our NEW pocket knives, so consider buying more than one!